Good news, Mass Effect fans. 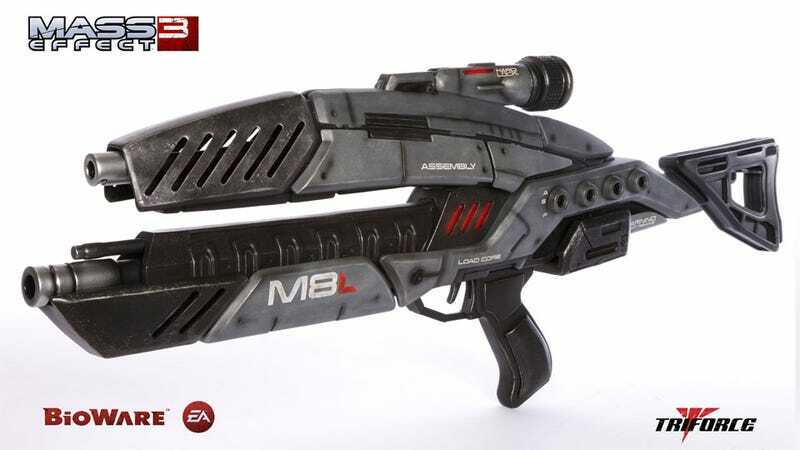 You can stop building your own replica weapons based on the series, because starting today, you'll be able to buy your own from EA's online store. This replica M8 Avenger Assault Rifle is 1:1 in scale, meaning it's exactly the same size it's designed to be in the game universe. That translates to a fake gun that's 34" long and weighs around twenty pounds. It's that heavy because it's cast in polystone (like expensive statues). The gun has also been hand-painted, and will be limited to just 500 units worldwide, which goes some of the way to explaining why it costs $650. Also, a word of warning if you're buying from outside the US: "Due to the nature of this item, international shipments could be confiscated by your Customs Agency and cannot be refunded. Please use caution before ordering." So check if your country is cool with you importing fake guns. Specifically, fake space guns from the future.